Don’t look now but the flip phone is about to make a comeback. At least, that’s what LG hopes: The company has crammed Android in a flip model aimed largely at the aging population that still wants to get in on the smartphone fun. Dubbed the Wine Smart, LG’s new handset uses a 3.5-inch, 320 x 480 resolution touchscreen on half of the phone, while physical alphanumeric keys and and a directional pad adorn the other half. You can navigate through apps in multiple fashions then: Either by tapping the touchscreen like a modern smartphone or with navigation buttons for old-school use. The large screen icons are supposed to be helpful for those with aging eyes as well. 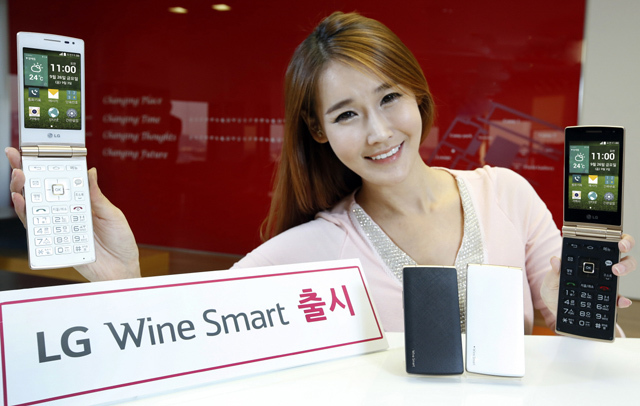 Aside from the look of yesteryear with a modern smartphone twist, the Wine Smart has a “safe keeper” function, according to LG. The company says it helps in the case of a fall because when the phone has been unused for a long time, it can automatically send its location to a pre-determined contact. Of course, if you do fall with the phone, you could always send a request for help over IM: The Wine Smart is geared towards simple text input with the large hardware buttons. The phone runs [company]Google[/company] Android 4.4 KitKat, comes with 4 GB of internal storage expandable with a micro SD Card, and supports Wi-Fi, Bluetooth 4.0, and LTE. It also has a a built-in FM radio and 8 megapixel camera. LG hasn’t yet provided a shipping date for the phone.